Iowa's exclusive dealer for Johannus and Monarke church and home organs. What makes a Johannus organ sound so exceptional? Take a peek behind the scenes in our world of music. The process starts in a church by recording pipe organs on site. We take recordings in lots of different churches so we have a diverse range of stops and styles in our repertoire. We set up in a church in the evening and place sophisticated microphones as close as we can to the front of the pipe chamber, so we capture the information in great detail. We measure the physical depth of the chamber because pipes that are closer to the front sound slightly louder. We start recording at 9PM to eliminate many outside noises and continue all night long and generally do about 25 stops a night. All stops are recorded key by key and the sound and reverb are recorded separately. This lets us keep the clarity and purity of the original pipe organ sound and then mimic the intended acoustic effect by using the authentic reverb. To help record the reverb Johannus uses a highly advanced speaker that plays a signal from 14Hz to about 22Hz (no longer audible to the human ear) within a 30 second time frame. This makes it possible to analyze the decay pattern of the individual frequencies, which benefits the quality of the Johannus reverb. Back at the factory with all the recordings the first basic step is returning all the physical pipes to their original position in the digital copy. We take photos of the pipe chamber so we know exactly which pipes were where. Whether the pipes were in the front or back makes a difference in the sound. In the final stages we make sure those positions can accurately be heard. The tones are then enriched with natural additions from the pipe organ such as the phenomenon that happens when too many keys are pressed at once (wind sag). This creates a temporary shortage of wind pressure causing the tones to be lowered slightly. One other effect which is meticulously simulated is the tremulant. Finally, the individually recorded reverb is added to the stops. The stops are then saved to voice cards so the motherboard in the Johannus organ can access them. Once these cleaned and fine tuned samples are linked to the keys of the Johannus organ the route from the pipe organ to the digital organ has been completed. The best thing about our technique is that we use "real-time sampling". That means nothing more or less than that a Johannus organ lets you play exactly the same sound as the pipe organ we recorded. Nothing has been generated; there's nothing synthetic about it. What you hear is exactly how the original pipes behave and sound. Another distinctive feature is the separate recording of sound and reverb, so the final result is better than simulator solutions or other software programs. To reach the best possible sound you also need a carefully constructed configuration of speakers. We spend a lot of time working out the number of channels, type of amplifiers, audio configuration and voicing. The combination of original pipe organ sounds and exceptional technology is what gives our organs that world-famous Johannus sound. Find out more about Johannus organs and the Johannus Organ Company. If you are considering a new digital organ, pipe organ or hybrid for your church or home you owe it to yourselves to call or email us. 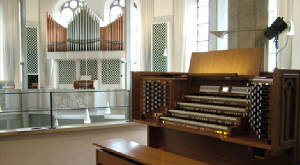 Kuyper's Music the Johannus Organ Company's exclusive representative for Iowa, Nebraska and other Midwest states. Contact us to learn more about the right Johannus organ for you. If you'd like to find out more about Johannus Organs at Kuyper Music.